Goa, the tropical paradise of India is thronged with visitors throughout the year. And to accommodate such large numbers of vacationers, Goa has a wide number of hotels, resorts, beach shacks and holiday homes. These staying options are well equipped with all modern amenities and classic interiors to suit the tastes of its guests. Most of these accommodations are built at the beach side, providing an enthralling scenic view of vast azure Arabian Sea and silvery sandy stretches. 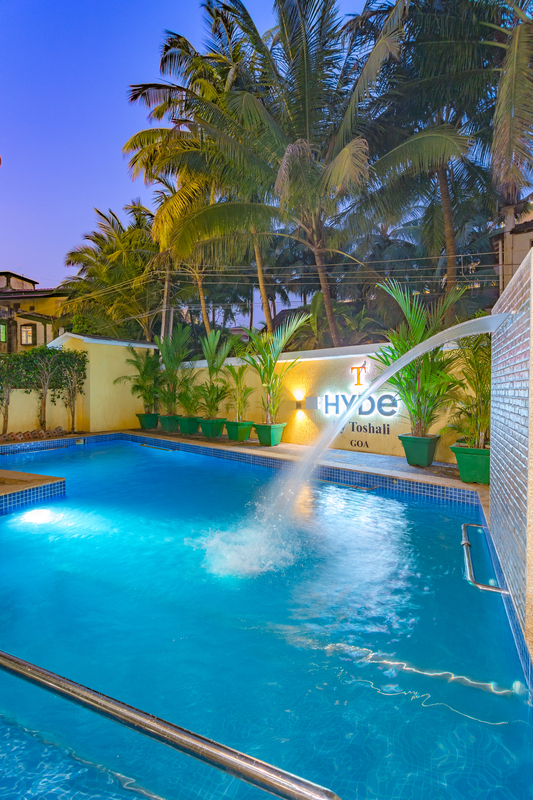 Among the wide range of choices of resorts and beach hotels in Goa, we are suggesting Hyde by Toshali for you. It is one of the north beach hotels in Goa, located near the sandy beach of Candolim. This Goan hotel houses classy rooms with the best amenities. The hotel has best rooms, along with other facilities like restaurant, bar, conference hall, swimming pool, beauty salon, fitness center, water sports, tennis, squash, badminton, sauna, Jacuzzi, children center, travel desk, car rental, babysitting, doctor on call, laundry, safe deposit, currency exchange and room service. If you think that Goa rides on the popularity of its beaches, then you need to explore the towns to get your facts right. Even though the beaches form the biggest USP of the state, Goa also makes jaws drop with its magnificent portfolio of historical forts, heritage buildings, old churches and natural forests & parks. So pack your bags and make your stay at Hyde by Toshali one of the best beach hotels in Goa to visit at least once in a year to this city. To complete your visit to Goa, the beach hotels in Goa do their best, so that you won’t go back with any dissatisfaction.